and “Midnight Flyer” (1972). The Osborne Brothers’ final chart appearance came in late 1986 with a new version of “Rocky Top”. 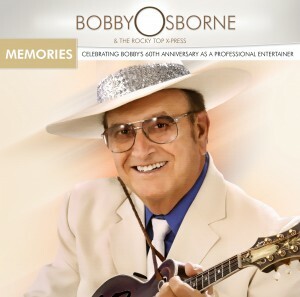 Grand Ole Opry Star Bobby Osborne tells us the story of “Rocky Top”. In 1994, The Osborne Brothers were inducted into the International Bluegrass Music Association’s Hall of Honor. The induction is considered bluegrass music’s highest honor. In 1973, the Osborne Brothers performed at the White House as the first bluegrass group ever. Their song “Ruby Are You Mad” came in 1956 after signing with MGM Records (1956) and began a string of hits through 1986. Among them were “Once More” (1958), “Up This Hill & Down” (1965), “Making Plans” (1965), “Rocky Top” (1967), “Tennessee Hound Dog” (1969), and “Midnight Flyer” (1972). The Osborne Brothers’ final chart appearance came in late 1986 with a new version of “Rocky Top”. “Rocky Top” is an American country and bluegrass song written by Felice and Boudleaux Bryant in 1967 and first recorded by the Osborne Brothers later that same year. The song, which is a city-dweller’s lamentation over the loss of a simpler and freer existence in the hills of Tennessee, is one of Tennessee’s eight official state songs and has been recorded by dozens of artists from multiple musical genres worldwide since its publication. In U.S. college athletics, “Rocky Top” is associated with the Tennessee Volunteers of the University of Tennessee, whose Pride of the Southland Band has played a marching band version of the song at the school’s sporting events since the early 1970s. The Osborne Brothers’ 1967 bluegrass version of the song reached number thirty-three on the U.S. Country charts.